Purchase Premium Packaging for Your Cookies Right Here! 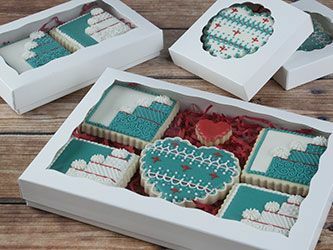 When cookie consumers (noshers of num nums) properly perceive your packaged cookie presentation, they shouldn't be thinking about the cookie box, they should be transfixed by the alluring presence of the sweet sculptures within. Your cookies are the rock star and your BRP cookie boxes are the roadie...or the stage...or the promoter. For our newest cookie packaging, your glazed artistry is revealed from beneath the biggest window we've ever hung in a box. These confection-tested cookie boxes are the result of a classic collaboration between cookiers and our resident box making meastros - masters who have milked maximum magnificence from the package producing process to make available the finely-tuned cookie encasements you see below. The Cookie Conclusion: We feel these are amazing boxes because they were coauthored by amazing people. Special thanks to you generous cookiers who developed and tested these cookie boxes with us.